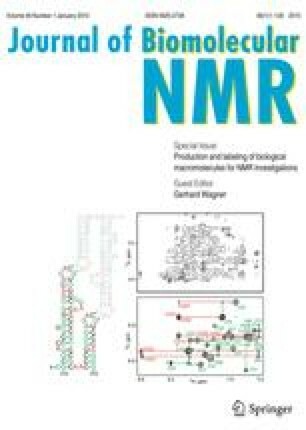 The preparation of stable isotope-labeled proteins is necessary for the application of a wide variety of NMR methods, to study the structures and dynamics of proteins and protein complexes. The E. coli expression system is generally used for the production of isotope-labeled proteins, because of the advantages of ease of handling, rapid growth, high-level protein production, and low cost for isotope-labeling. However, many eukaryotic proteins are not functionally expressed in E. coli, due to problems related to disulfide bond formation, post-translational modifications, and folding. In such cases, other expression systems are required for producing proteins for biomolecular NMR analyses. In this paper, we review the recent advances in expression systems for isotopically labeled heterologous proteins, utilizing non-E. coli prokaryotic and eukaryotic cells. The authors thank Drs. Noritaka Nishida, Toshihiko Sugiki, and Osamu Ichikawa for useful discussions. This work was financially supported in part by the Ministry of Economy, Trade and Industry (METI) and the New Energy and Industrial Technology Development Organization (NEDO).